One of the biggest engineering feats humanity will probably ever create, will be the Space Elevator. What is a space elevator? Exactly what it sounds like. 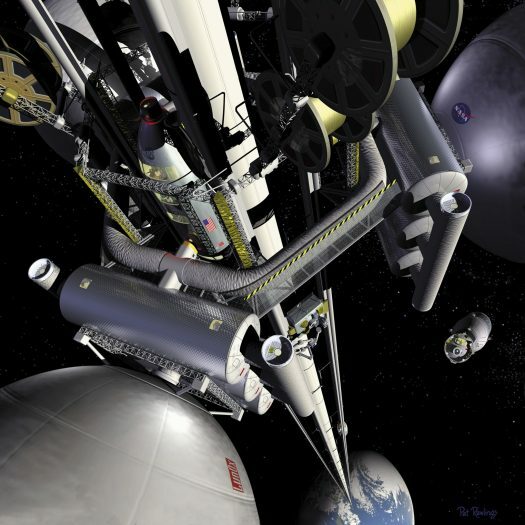 A space elevator model normally consists of four main components: an anchor, a tether, a counterweight and a climber. Imagine you were swinging something around your head with a rope. Now imagine that you are the Earth, your hand is the anchor, the rope is the tether, and the thing at the end of the rope is the counterweight. This is the idea behind a space elevator: use Earth’s momentum to keep something up in orbit while it is connected to the Earth, and use the tether connecting them to send things back and forth between Earth and space. The applications of a space elevator are astounding. With a space elevator, there would be minimal use for rockets to go to orbit, cutting down on space debris significantly, and decreasing space entry cost by several billions of dollars. However, there are reasons why we aren’t already pouring our space budget into the creation of a space elevator. There are several drawbacks that make a space elevator extremely difficult to build or even maintain. The largest problem would be the tether. We have yet to find a sufficiently strong and abundant resource that could withstand the tension required to keep the counterweight in orbit, nor do we have a proper method of keeping the tension equal across the entirety of the tether, something necessary for the structural integrity of the elevator. One candidate for the tether material is the carbon nanotube, an incredibly strong material made entirely from tightly-knit carbon atoms that could theoretically withstand the tension. However, these nanotubes can only be properly created in extremely small batches, and we have yet to develop a method for large-scale production of nanotubes, much less the twelve miles of tether material needed. Other problems presented by the elevator include the presence of the elevator itself. It would need to be built on the equator so that there is a maximum centrifugal force to keep the counterweight in orbit. Passengers in the lifters would also be exposed to much higher levels of harmful solar radiation as they travel out of the atmosphere. There would need to be an airspace control so that no aircraft accidentally crashed into the tether, and on the same note, there would have to be a way for the tether to not be affected by space debris, whether it be that the tether itself moved out of the way, or that it could withstand a collision without sustaining damage. There have been several other possible concepts for cheap and effective space launching methods, such as orbital rings, skyhooks, space fountains, or launch loops. All of these have different drawbacks and advantages, but the space elevator seems to be the most effective and well-understood system for non-rocket space entry. And while it seems impossible today, that almost never means that technological innovation won’t make it possible in the future. And what a cool future it will be.